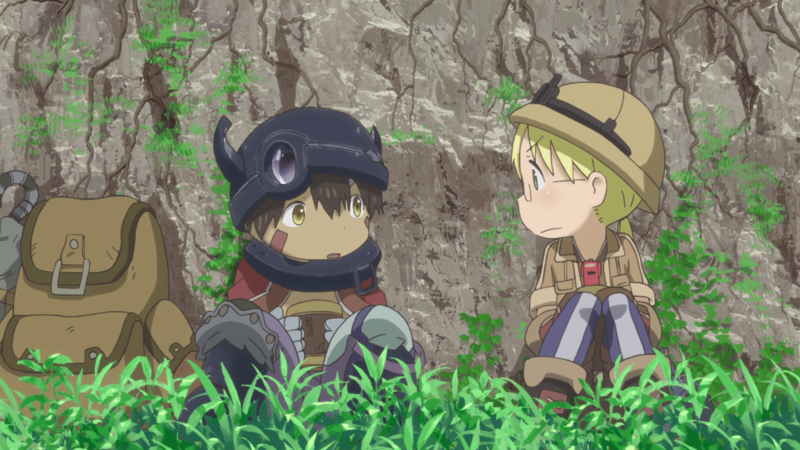 From setting to character, story to music, this season’s Made in Abyss is all anyone is talking about lately. 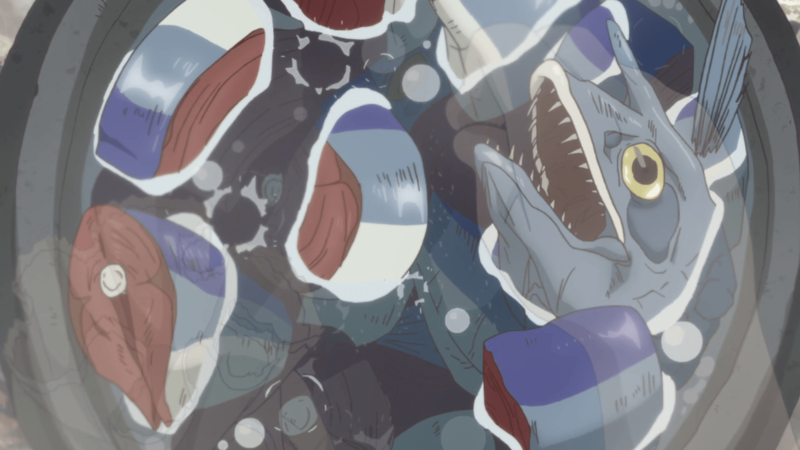 The show, a manga original, stunned viewers right from the beginning with its visuals and Kevin Penkin’s haunting melody, “Underground River.” That overwhelming feeling still persists more than halfway through the series, and now that we’ve made it to the third level of the Abyss, the danger seems more present than ever before. Our moments for respite are far and few in between. One thing about them obviously stands out to me: many of those quiet moments are spent around food. Fishing season is in full force back in my home state, which means tons of salmon ready to eat fresh, or to preserve by canning, smoking, or freezing. Growing up, my mother was always “that crazy Asian lady” who saved fish heads from being discarded by others so she could use them in her cooking. I loved her “fish head soup,” otherwise known as sinigang. Each spoonful tasted like the essence of fish. I especially enjoyed picking out the succulent cheeks and saving them for last. Plenty of cultures around the world also use fish heads and scraps for cooking to create a flavorful broth that can be used immediately or saved for later. 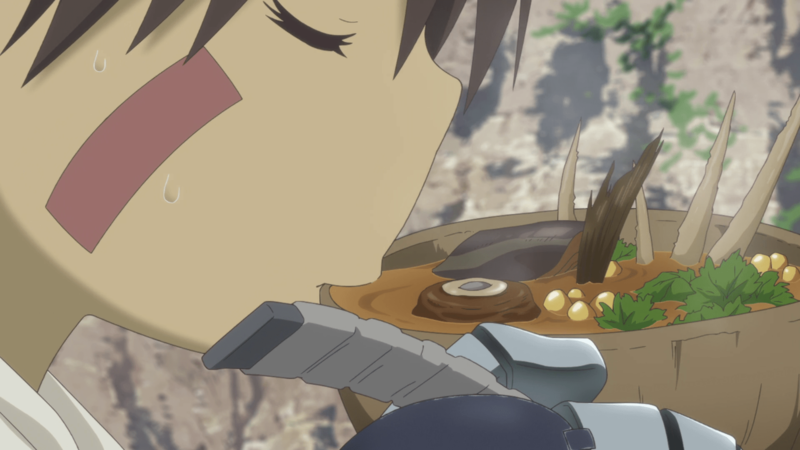 Riko and Reg work together in the fourth episode of Made in Abyss to create a simple but delicious fish soup. 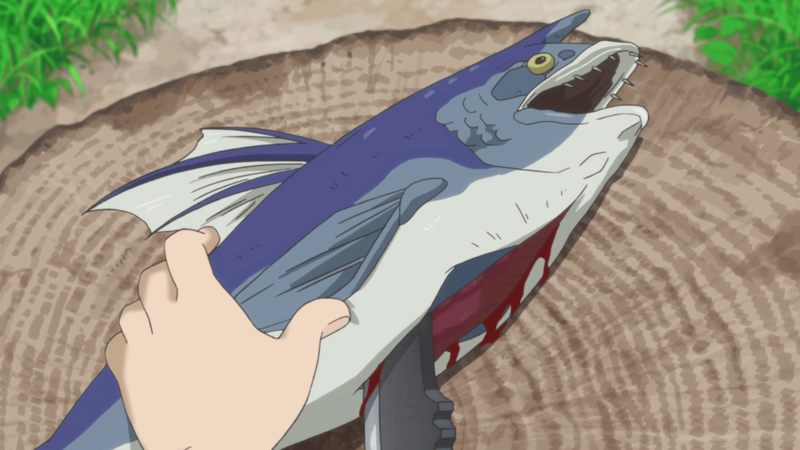 We watch Reg dive into the waters to catch some demonfish, and see Riko clean and cut like a pro. Smoking the innards for later consumption, she proceeds to use the rest of the fish–head, bones, and all–to extract every bit of flavor into their meal. Her cooking skills reveal the valuable time spent studying how to survive in the abyss. Cave raiders can be gone days, weeks, and even years at a time–far too long to bring enough prepared food to last. They need to not only survive the monsters and curses, but also their own hunger. With knowledge, ability, and a few non-perishable goods, hearty and tasty food can be made fresh from the surrounding environment. Riko pulls out her treasures of “Eternal Fortunes” seasoning and a miso stick; nature provides everything else, the greens, water, and fish. 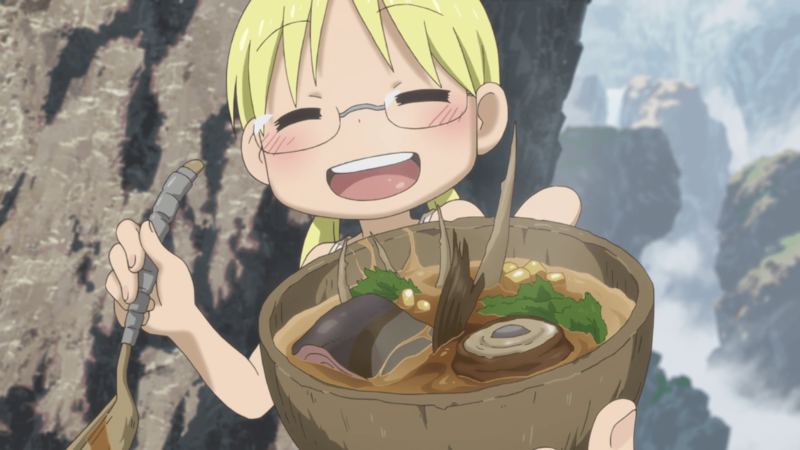 Just like the cave raiders who are born from past raiders and years of training, Riko’s Soup combines ingredients from outside and inside the abyss. 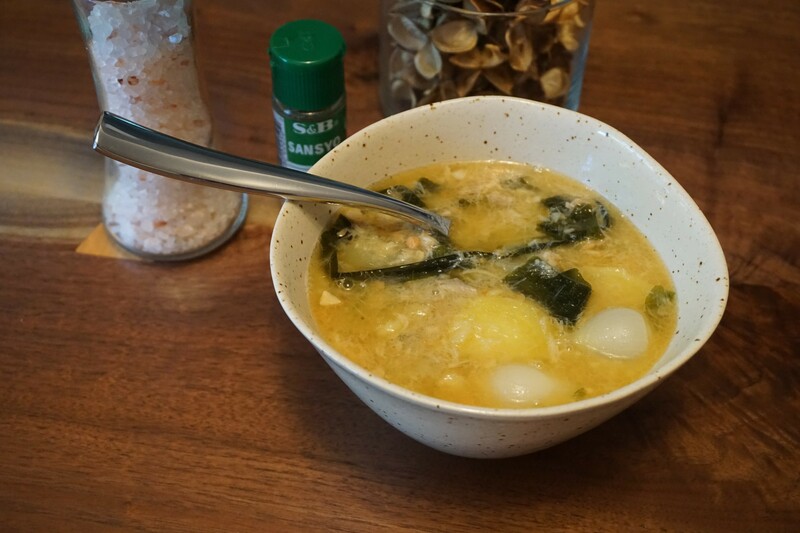 I hope you enjoy my version of Riko’s Soup, a miso cod fish stew that warms the belly and soothes the heart. “The beef and pork are so tender and flavorful…frying and stewing them together makes the different flavors of both meats mingle together to create a taste that neither could produce alone. 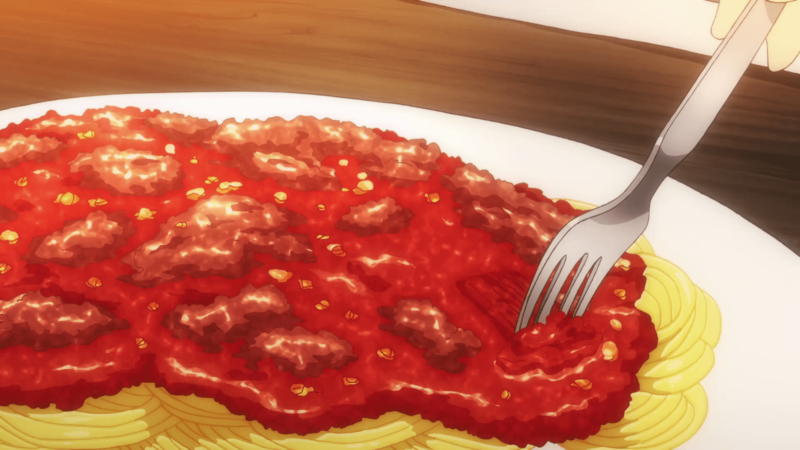 And the stewed vegetables of another world used as the sauce’s base–they were simmered and crushed into a liquid with a sweet sourness and lots of flavor” (“Spaghetti with Meat Sauce”). This season’s culinary delight is Isekai Shokudo, otherwise known as Restaurant to Another World. In the first part of episode three, Western Restaurant Nekoya’s “Master” serves up spaghetti with meat sauce for Thomas Alfade, a former proprietor of Alfade Company, and his grandson, Sirius. Thomas’ love for Nekoya’s spaghetti spurred him to popularize wheat noodles and tomato sauce in his own world so that he could eat the dish whenever he liked. Sirius is surprised to hear this truth, as well as learn of the trade of ingredients between Nekoya and his own world that allows both sides to collaborate and grow. I, too, have a soft spot for spaghetti, and can recall a handful of different variations served to me growing up. My mother never seemed to follow a recipe, choosing her ingredients on whim and randomly hitting us with spice. Some of my favorite variations include sweet Italian sausage, hot dogs filipino-style, and roasted garlic sauce. She made it so much that I actually got sick of spaghetti. I never ordered it at restaurants. I never cooked it once I moved out on my own. It wasn’t until I met my husband, who loves traditional red sauce spaghetti, that I started making it on my own again. For this recipe, I chose to follow as best I could the ingredients described by Sirius. Feel free to follow it to the letter, or throw in some twists of your own. I find spaghetti sauce to be very forgiving to experimentation. It also freezes well for later consumption. Happy Valentine’s Day! 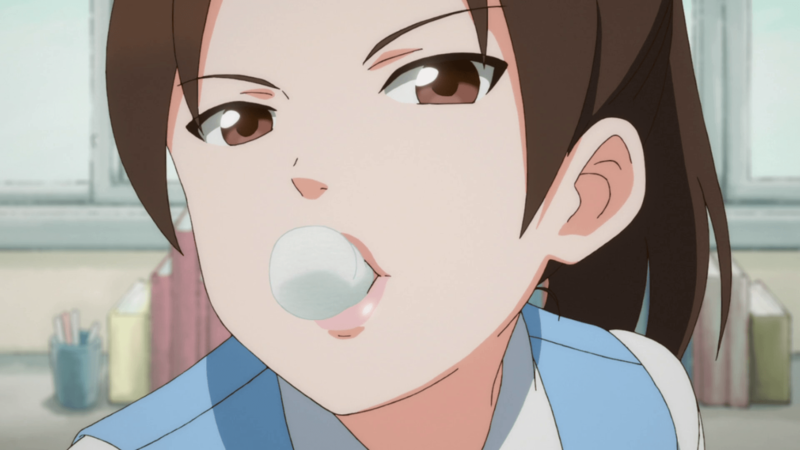 Today’s the day of love, and what better way to celebrate it than with this season’s Ojisan to Marshmallow? 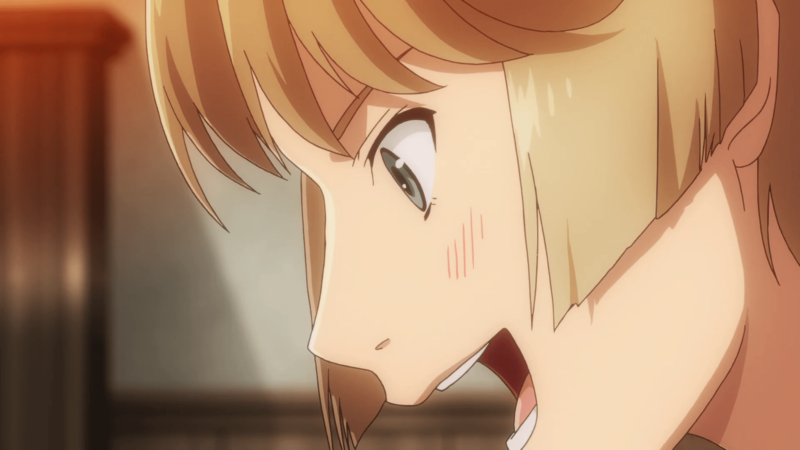 This 12-episode series, each a short three minutes in length, follows Wakabayashi Iori and her affections for coworker Hige Habahiro, a large man who has eyes for nothing but his favorite brand of marshmallows. 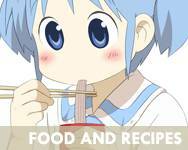 A delightful extra to the anime is the inclusion of simple, 34-second-long recipe instructions after the ending credits of most episodes. They’re the kind of treats that people of all ages with very limited equipment can make, like marshmallows on toast and marshmallow apple pie. Taking inspiration from these recipes, I present to you chocolate marshmallows dipped in dark-chocolate and sprinkled with crushed pretzels! Props to Dessert for Two for the main recipe, which is super easy. I encourage you to give it a try! Just a banner update: I threw together a quick and simple banner with a new spring show featured: Shokugeki no Souma. Give a warm welcome to Megumi! Hopefully soon I’ll attempt her famous onigiri. It was only last fall that draggle introduced me to this manga, and though I loved the concept and cooking, I was shocked at its bawdy display of eating. 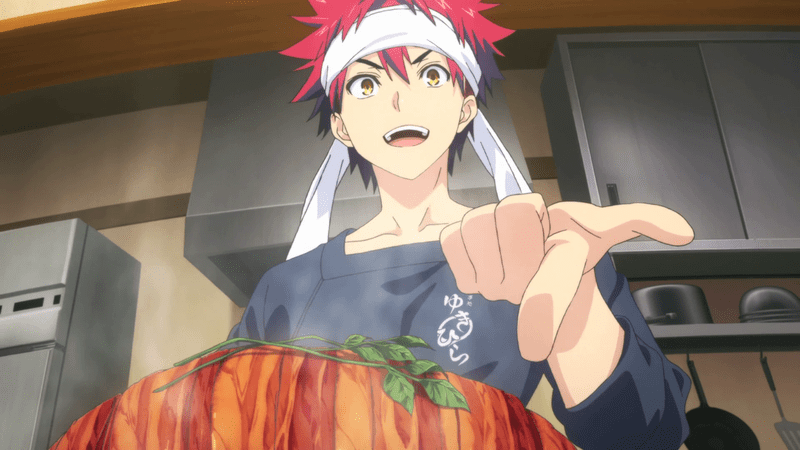 I quickly overcame that initial horror and came to thoroughly love Shokugeki no Souma. 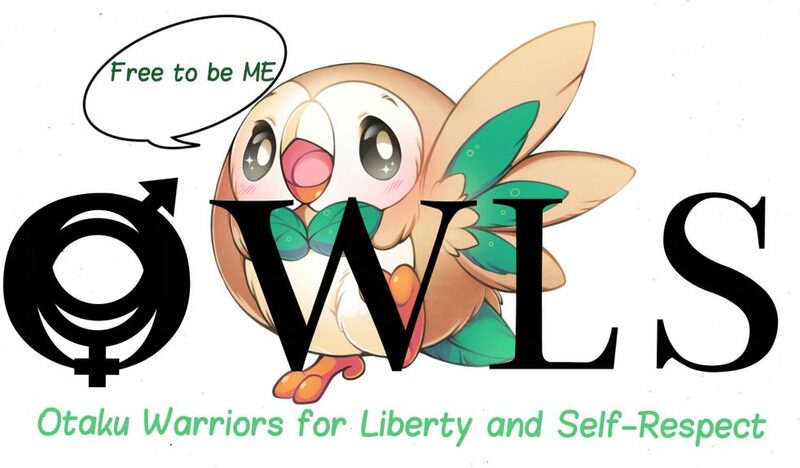 Imagine my delight when I found out that it would be soon adapted to anime! I was worried that the tone of the manga wouldn’t translate over to the anime, but for the past two weeks, those fears have remained unfounded. There are plenty of meat juices and peanut buttery tentacles to go around for all the diners! 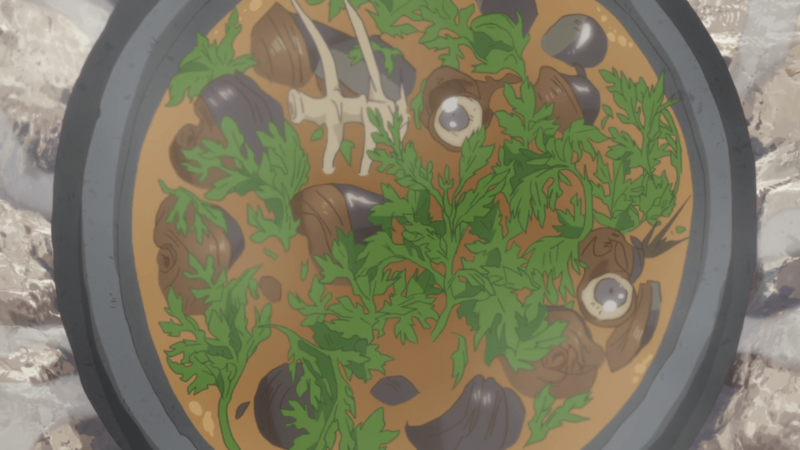 The first episode of the anime, “An Endless Wasteland,” features Souma’s potato roast, a twist on a pork roast featuring mashed potatoes and mushrooms wrapped by crispy bacon and soaked through with meat juices and a red wine sauce. While the dish looks heavenly, I wasn’t too keen on an entire meal of what I would usually prefer as a side dish. I hunted around online for ideas and stumbled across Savory Style’s Mashed Potato Bacon Bombs and decided to try their snacks out, as well as add in some garlic and onions to tie in to Souma’s version. Go ahead and give the below a try and let me know what you think! And if you attempt a version truer to Souma’s, I’d love to see your results of that as well. 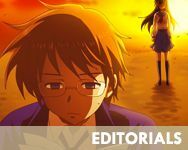 The present Flonyard of Dog Days is a land of mostly peace, where neighboring nations are more like family and “wars” are excuses for friendly battles. The Flonyard of the past, however, was a place of darkness. Demons overran the land and prevented communication between the kingdoms. It was in this time period that Couvert’s ancestor, Clarifier, summoned the Legendary Hero, Adelaide. It was “Fi’s” wish to eradicate the demons and bring peace to Flonyard. She dreamt of a world where everyone could make safe travel and trade. Fi and Adel’s journey started out rocky, but through dedication and with good friends they laid the groundwork for the Flonyard in which Cinque finds himself at the start. There’s a different type of joy to be had from peeling away plastic wrappers from ready-to-eat foods and savoring the blend of tastes that have been melding for who know how long. The covering falls away, and what is left is a meal that requires nothing of the eater but the act of eating itself–no cooking, little to no cleaning beforehand, no dishes to wash. The luxury is a refreshing change from daily routines as long as you don’t look too closely at the nutrition labels. A couple weeks ago, the ever-delicious Koufuku Grafitti sent me on a trip to the local Asian grocery store in search of my preferred to-go meals. It’s not often that I step away from slow cooker dinners and sit down restaurants, but there are times when nothing else beats the convenience and unique taste of prepared foods. And while my favorites don’t evoke specific memories like Ryou’s, I look fondly upon them as treats I never indulged in until I moved to Seattle back in 2013. 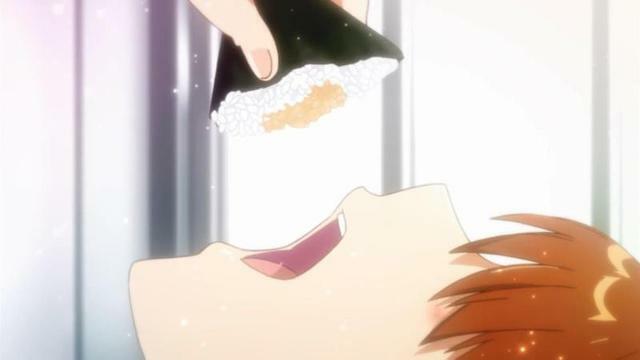 Koufuku Graffiti is this season’s scrumdiddlyumptious offering for food anime. 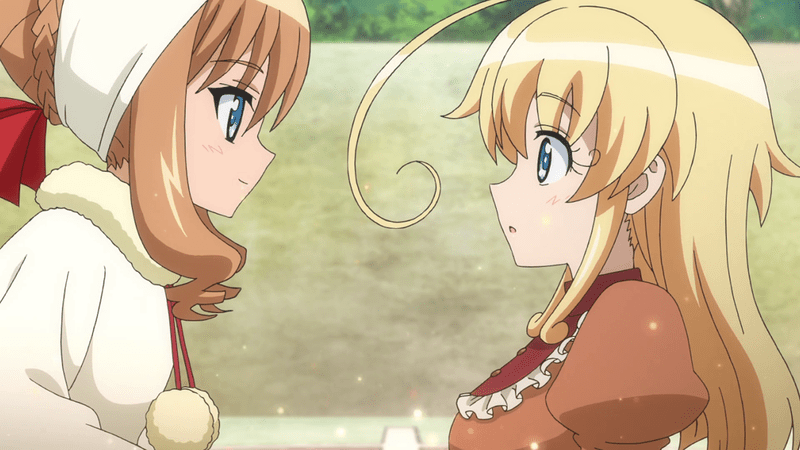 Our main girl, Machiko Ryou, lives alone with the memories of her grandmother’s meals and their time together. Her lessons learned in the kitchen and love for the company of others compels her to continually cook favorites and experiment with new dishes to eat together with her friends. 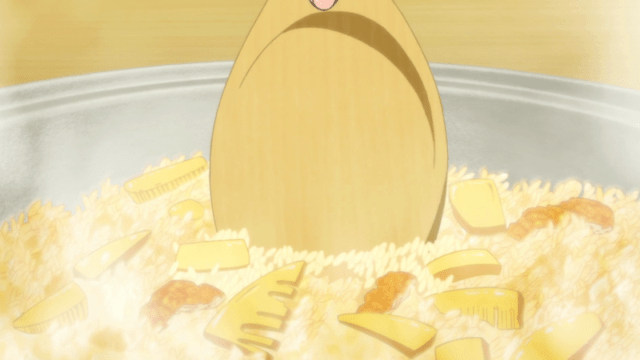 Episode three, titled “Jinwari, Bariri,” features takenoko gohan. Requested by Ryou’s cousin, Kirin, the bamboo shoot rice dish has a comforting, yet refreshing, taste and texture reminiscent of spring. Along with their friend, they savor the freshly cooked rice along with a side of clear, hot soup. The result is healthy fullness that leaves the mouth and stomach satisfied. There are many variations to making takenoko gohan, and I went with one of the easiest methods using my rice cooker. Follow along and let me know how yours turns out! 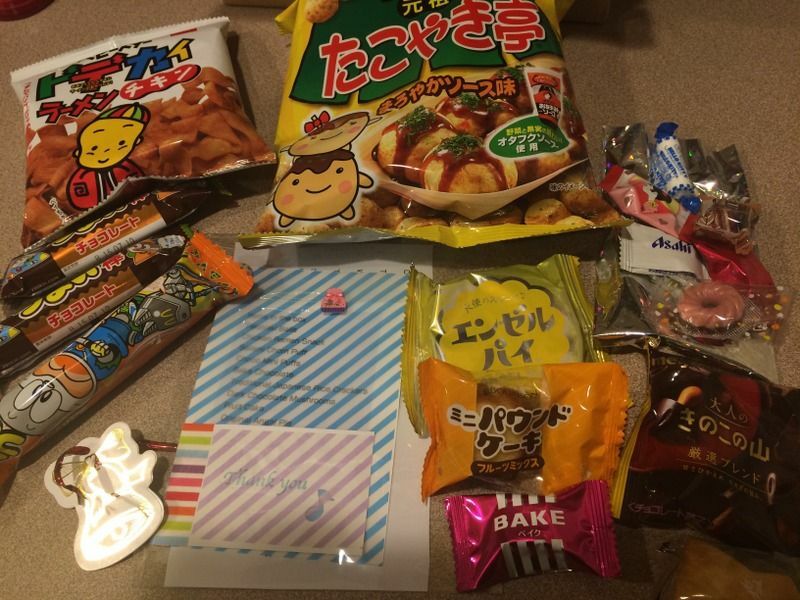 I recently received a complimentary snack box from the Japanese online snack service, Oishi Fun. The box arrived about a month after they had first made contact with me, and was packed full of curious treats and candies. I’ve experienced similar services through U.S. companies like NatureBox and JewelMint, but this is my first time trying out an International option.